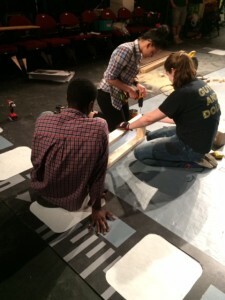 Company One Theatre’s Apprenticeship Program is a professional development opportunity designed to give young Boston High School Students the skills they need to work on professional theatrical productions. Our program develops many of the skills necessary to the 21st century workforce including adept communication and collaboration, adaptability and flexibility, and critical thinking — all in a positive, creative and safe space. Our program is appropriate for all High School students, regardless of prior production experience. It’s perfect for anyone interested in theatre as a vocation or avocation, and for those who value the intersection of art and community as well. Company One Theatre’s professional staff and local artists teach master classes, which introduce and deepen students’ understanding of every element of the production process, including Directing, Stage Management, Production Management, Fight Choreography, Dramaturgy, Technical Design and Front of House Management. In addition, apprentices receive classes on essential skills, which apply to the workplace more broadly, including Resume Writing, Communication, Financial Literacy and Budgeting. Jordyn Clements is an upcoming senior at Wellesley High School and couldn’t be more ready for what the outside world has to offer her. She has begun her journey working as a Music Ambassador at Berklee College of Music for two consecutive years, as well as being a part of Company One’s teen apprentice program. As a young and aspiring black woman, a life goal of hers is to become successful at whatever it is she is going to choose in life. In this case, she has chosen the profession psychology. When looking through the eyes of society, black women are deemed successful if they are rich, independent, and have a innumerable amount of fans or followers. Jordyn is making it her priority to make sure that the stereotype of black women is going to change, starting with her. In 2019 she’ll be a freshman in college and she couldn’t be any more anxious to get her journey of change started. Tanairis Diaz was born and raised in Boston. She currently goes to Boston Arts Academy (BAA) where she studies theatre. She discovered her passion for acting as a child, while watching the movie “Aquamarine”.What she found most captivating was the actors’ ability to successfully convey a romantic relationship without having any prior connection to each other. Her first performance was BAA’s end of the year showcase called Expo, where she performed a monologue from Larry Silverberg’s book “Winning Your Auditions.” Aside from acting, Tanairis also enjoys technical theatre. If she had to choose, set design would be at top of her list. This is Tanairis’s first year at Company One and she is thrilled to be joining as an apprentice. Zanique Horton Durrette is a cellist as well as visual artist that teaches and gets lessons from the non-profit organization, City Strings. She attends Boston Latin Academy and is also in the orchestra program there. With City Strings she has been able to perform in many different locations such as the Strand Theatre and 12 Baptist Church with a large ensemble of people younger and older than herself. She is currently a teen apprentice with Company One for the summer, this is her first job and is excited to experience the behind the scenes of theatre for the first time. She is very eager to broaden her skill set and experience new things with the organization. Anjaliyah Echemendia is a Boston native whom is proud to be joining Company One as a student apprentice. She has participated in school productions which gave her the courage to express herself and get out of her shell. In 5th grade, she participated in her first musical which was Charlie and the Chocolate Factory. In addition to theater, she participated in talent shows and other school productions. In 6th and 8th grade, she performed plays inspired by her own experiences, and performed in the musicals The Wiz in 7th grade and High School Musical Jr. in 10th Grade. She got most improved in performing arts for 5-8th grade. In addition to the arts, she’s also very passionate about playing sports including football, basketball, soccer and track. Jayden Lewis is an 18 year old who just recently graduated from TechBoston Academy. He would like to continue his education and attend college next fall. He would also like to work with younger children and provide them with a better education. Jayden has recently joined Company One Theatre as a teen apprentice, and is ready to embark on a new journey through theatrical workshops and experiences. Jayden is ready to take on new challenges and to see what the future holds for him after Company One. Ayan Mohamed is very excited to be working with Company One Theatre, where she is a teen apprentice in the education program. She performed with some colleagues helping them with their own piece about violence in the community when she was only 11 at the Strand Theatre, with the mission of spreading awareness about the hardships some youth go through in experiences of violence in their own neighborhoods. She will be attending John D. O’Bryant School of Mathematics and Science next fall. She’s looking forward to see what she can accomplish at Company One Theatre. Raymond Moore Jr. is a teen apprentice at Company One Theatre. He’s interest in technology, he wants to learn more about theater. He was involved in film production while attending Madison Park. In the future he would like to use this knowledge in college. He’s looking forward to what Company One has to offer for him. Jala Settles is currently a teen apprentice at Company One for the summer, where she is learning the key skills that can be applied in not only theater but also in her everyday life. Outside of work, Jala is a dancer and a singer. Her journey in dance started at the age of three and singing at the age of seven. Over the course of her lifetime she has participated in the BAA summer dance camp, Alvin Ailey workshop, various competitions, Greenfest, Roslindale parade, and other special occasions like retirement and birthday parties. Her passion for contemporary dance became clear in June of 2017 when becoming a member of Jo-Mé Dance Company. Other than being involved in the arts, Jala is a rising tenth grader who is and has been an active member of her school and in different communities. In middle school, Jala participated in many school musicals and was president of student council, and she is an active member of her high school class. She also helps serve food at food kitchens, helps out at community events, gives out food and socks to the homeless in different areas, and supervises children for Salvation Army’s after school program. Leilei Spy is a rising junior at Boston Latin Academy, where she is a member of the Academy Players, working backstage with lighting and sound. She is also an intern at Riverside Theatre Works, where she has done lighting for productions including Thoroughly Modern Millie and Sister Act. As an apprentice at Company One Theatre, Leilei has loved having this opportunity to learn more and to broaden her experience in theater! Tay Williams is a 15-year-old African American teen apprentice at Company One in the education department who hopes to spread the LGBTQ statement all around the community and will soon start her freshman year in high school at New Mission High. She has some experience in theater at the one and the only Strand Theatre in Uphams Corner: at the age of 12, Tay and her classmates took a field trip to perform at the theatre about violence in their own communities, with each student telling their own stories and experiences with violence. Tay’s hobbies include singing, songwriting, dancing, debating and making people laugh. Tay has been singing in multiple talent shows since the age of seven to get better at her art and her confidence. You can most likely find in her creating her music at the park. Interested in working with Company One Theatre as a Production Apprentice? 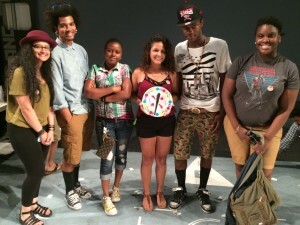 Company One Theatre collaborates with the City of Boston’s Department of Youth Engagement and Employment to offer employment opportunities for teens during both the summer and the school-year. For more information about Company One Theatre’s Production Apprenticeship, contact Education Program Manager, Pascale Florestal at pflorestal@companyone.org.